Doctor Who - Regeneration In A Crowded TARDIS | Warped Factor - Words in the Key of Geek. Tony Fyler looks at how the Fourth Doctor’s final trio of companions dealt with his regeneration – and argues that one more season of Tom Baker goodness would have made all the difference. At the time the Fourth Doctor regenerated into the Fifth, all the previous regenerations had been experienced by companions with a shared history alongside their Doctor: Ben and Polly may well have been mystified when the crotchety old white-haired man became the unpredictable little mop-topped scruffbag; before being led back to their own times, Jamie and Zoe had been travelling with their Doctor for some time; and Sarah-Jane and the Brigadier had both been friends of the Third Doctor for some time too (though the Brig’s experiences with the Second Doctor allowed him to come off as elder statesman with his ‘Here we go again’). But when the Fourth Doctor fell off a radio tower and began to change, his Tardis – and his technical ‘death-bed’ - was full of people with very different ideas about who he was and what that meant. The Doctor had chosen none of them to be his travelling companions – though to be fair, with the exception of K9, the Fourth Doctor never really chose his companions – Sarah-Jane was in situ, a choice of his predecessor, Harry walked in to prove a point, Leela ran into the Tardis against his will, Romana was foisted on him by the Time Lords and the White Guardian, Adric stowed away and so on. The trio with whom the Fourth Doctor ended his time though were very specifically not people he would normally have chosen to travel round the universe with, and so it’s interesting to contemplate their potential understanding of the world in which they found themselves. Despite stowing away, by the time they went to Logopolis, Adric the rebel-swot had settled into a distinct relationship with the Doctor, reminiscent of the students of Ancient Greece or Rome – he had stumbled upon a peripatetic teacher, who could massively broaden his understanding of the universe in all its colours. Adric seemed to regard himself as Robin to the Doctor’s Batman, as though one day he would learn enough to eclipse his teacher, but for the moment, he must stay, relatively limpet-like, by his side. 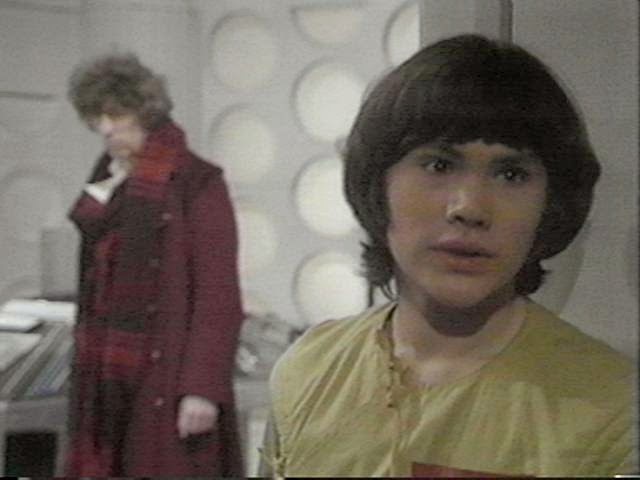 There’s also a distinct teen-boy sense of proprietorial point-scoring from Adric in early episodes – not so much with Nyssa, who he has at least met in situ on Traken, and with whom he feels a kind of cleverclogs-bond, but certainly with interloper Tegan, who Adric appears to have very little time for at all, echoing the Fourth Doctor’s questions – where did she come from, and why is she here? Nyssa, by contrast, sees the Doctor as something of a hero – there’s a reverence for the Time Lords that comes more naturally to her as she’s come from our universe and heard of them by reputation, and there’s far less cling to her view of the Doctor because, just as the Doctor didn’t invite her into the Tardis, she didn’t ask to be there either – the Doctor swept in to Traken, did his best to save the Union from the malign influence of the ‘Melkur’, and then swept out again, leaving her world touched with legend before she was scooped up by the Watcher and dumped on Logopolis with instructions to join the travelling Time Lord. Then of course there’s Tegan. Good old Earth-representing rent-a-gob Tegan, all strop and shouting. She views the Doctor pretty much as a dangerous, unpredictable alien, but more as ‘the pilot,’ the only hope she has of regaining her life and any semblance of normality after he quixotically decides ‘That settles it – she’s got to come with us,’ and sets the Tardis in motion. There’s a throwback, in Tegan, to the very beginning of the show, to Ian and Barbara, more or less kidnapped from their lives by the unpredictable alien with the mad blue box. And then, just as they’re each beginning to come to terms with the Fourth Doctor – he’s gone, and some blond-haired young stripling is swanning about in his place. Adric, certainly, takes the change hardest – his mentor no longer seems to be as disposed to play the role of Grand Old Man of the universe, and we hear in Earthshock that the time for their question-and-answer sessions has been radically reduced now the Doctor has changed his nature and the two girls have arrived – you can almost hear Adric’s gender-jealousy, having gone from having his teacher all to himself, now he has to wait in line behind the calm, polite Nyssa, who is much more in tune with the Fifth Doctor’s personality than she would have been, long term, with the Fourth’s, and behind that ridiculous Earth-girl who doesn’t even seem to want to be on board the ship. Nyssa, again being aware of the Time Lords, takes the regeneration, like much else, in her stride, a decision made all the easier for her by the massive personal shock she gets when Traken – her entire planet and everything she’s ever known – winks out of existence, leaving her nowhere to go and no way of defining herself other than as Tardis traveler. Tegan meanwhile seems to deal with the regeneration as the next weird thing, rather than a massive cataclysm. She’s had very little experience of the Fourth Doctor, certainly not long enough to really become attached, and is still mourning for her Aunt Vanessa when the Doctor becomes a completely new person. She seems to approach the whole thing with a kind of ‘it’s alien – why should there be rules?’ fatalism. For someone who was eventually to leave the Tardis because it ‘stopped being fun,’ she gives very little indication of it ever being very much fun, allowing the viewer that most unlikely of sensations – sympathizing with Adric. 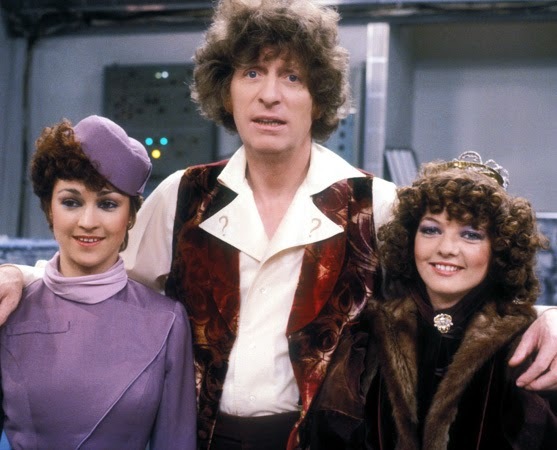 It’s tempting to speculate how the three companions would have got along had the Fourth Doctor found a rather less fatal way of dealing with the Master at the end of Logopolis. Certainly the dynamic would have been different: Adric would presumably have maintained his ascendancy as chief pupil. The Fourth Doctor, while less intrinsically suited to Nyssa’s personality, would have conveyed a rather more believable and generalized sympathy towards her plight as the sole survivor of the Traken Union. He would always have treated her with politeness, and would probably have been on his best behavior with her, while opening up her rather academic brain to a more practical universe, where the Fifth Doctor barely tried to do anything so noble, but allowed her academic side to flourish as a gift in itself. And what Tom Baker’s Fourth Doctor would have made of Tegan in the longer term, who can possibly say? Perhaps the constant demands to get back to Heathrow would have grated, and he would have dropped her off poste-haste. Or perhaps – and probably more likely, he would have relished the sparring with her as he sometimes relished it with Leela, and would have brought her closer into his mind with a big, beaming smile of teeth and eye-glint than ever the fifth Doctor could with his ‘Brave heart’ and his honest appreciation of how clueless he sometimes was. Perhaps one more season of the Fourth Doctor, in another dimension, held wondrous riches of companion-banter and allowed the full Tardis to gel in a way it never managed with the Fifth as he struggled to assert his own personality. Or perhaps it was a ghastly, histrionic mess of too many voices each striving to be heard – we’ll never know. What we can know is that if we don’t count the Tenth Doctor’s ‘vanity’ regeneration when struck by a Dalek weapon, filling the Tardis with new people immediately prior to a regeneration has never been done since, and in fact, the Fifth Doctor’s Tardis was as empty as it had ever been when Peri witnessed his regeneration. What’s the point of all this? Perhaps nothing more than an exercise in fan-fiction, inviting the imagination to play with the idea of that final Fourth Doctor season with three young companions, and perhaps to pay tribute to the warm genius of Tom Baker, which perhaps could have made it work, in a way which – with all due respect to ‘my’ Doctor – Davison couldn’t in his first season following so definitive a run.